With March upon us and Spring Break about to start, we are just SIX WEEKS away from Performance Week! Wow. Label everything! Add your child’s initials to the tags inside their costumes, tights, shoes, and any other important items in their dance bag or garment bag. An easy way to do this? Write on a piece of masking tape and stick it inside the item. Remember not to let your dancer play in their costume at home until after the recital. Although it’s tempting (and fun!) it’s simply too late for us to get a replacement if something happens to it! 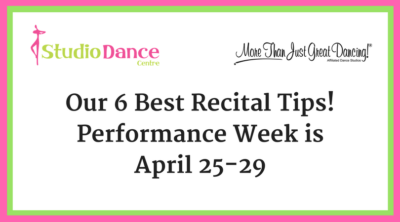 Find a few extra minutes to read through your Recital Info Packet, which was handed out during Sneak Peek Week. You’ll find all the details for Performance Week right at your fingertips, but we are just a phone call away if you have any questions. Encourage your dancer to keep a balanced schedule: help them get lots of rest, healthy snacks, plenty of water, and make sure they aren’t putting too much stress on themselves from school or dance. Even young dancers can internalize outside pressures, and we want to keep recital preparations feeling fun and exciting! Plan ahead for Photo Week (March 22-28) and any other extra items you might want to purchase, such as pre-ordering a yearbook program or recital DVD. You’ll feel less rushed if you’re able to knock those tasks off your list early on. Think about volunteering! If you’d like to help out behind the scenes during Performance Week, sign up with us to be a Backstage Volunteer; we have sign-up sheets at the front desk. Class Moms are able to watch their dancer(s) from wings of the stage, which of course we consider to be the best seat in the house! And hey, don’t forget to give yourself a pat on the back for being an awesome parent! We truly have some of the most dedicated, involved, and supportive parents (and grandparents) here at SDC, and we’re happy you’re one of them. Enjoy your Spring Break, and we’ll see you back in the classroom soon! « The Summer Schedule is Here!